With the new 12 x 12 divided Page Protectors and a monthly Scrapbook night preserving your memories this year will be a snap! This new easier-than-ever scrapbooking style, simply pair your photos and journaling with pre-designed cards and photos will make scrapbooking fun and rewarding as you see your book being completed! Won’t you join me in documenting your special moments? We will meet each month on the fourth Tuesday at 7:00. You will have all of the supplies cut and ready for you to create your pages. For an example of a completed page please see page 169 in the new Stampin’ UP! 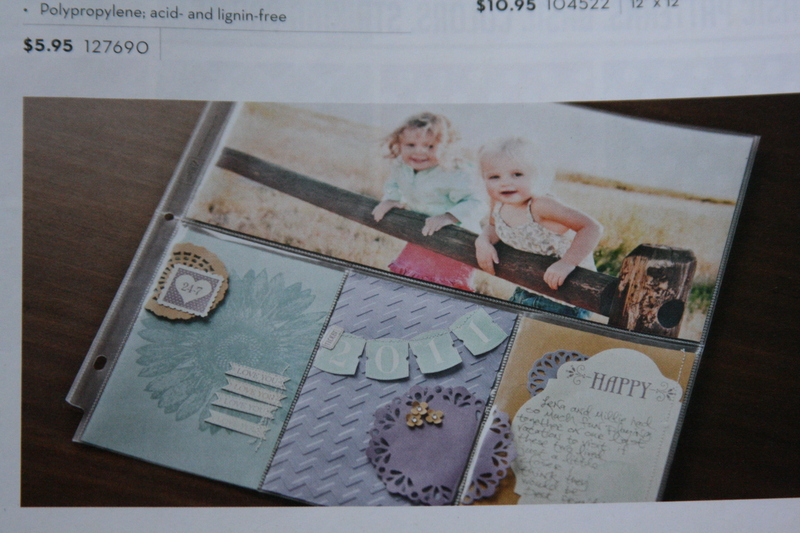 catalog, don’t have your catalog yet email me today or go to my website at www.stacilynch.stampinup.net and look today! Each month you will only need to purchase $20 of supplies and one of the months you will get the hostess benefits of at least $25 of FREE products! This is a year long commitment that will ensure you have a whole album of memories! Ask your friends and make it a girls night out! I really appreciate your business and hope you will join me in a fun year together! If you have any questions please call or email me! Retired Cash and Carry-This Friday! Get some great deals on my retired Stampin’ UP! products! I will have things our from 3-6 p.m. This will be your only opprotunity to get them so don’t miss out! This card is a sample from Leadership last year using one of the sets I will have for sale! Please let me know you are coming by email or phone. Thank you! Experience the 2012-2013 Stampin’ Up! Annual Catalog’s new Designer Series Paper, Ribbon and Embellishments with a Product Share! A product share is a little bit of everything. As you reserve your share, I save a spot for you. When a share fills up, I collect your payment, then order the product. It’s then split it up between the share participants! To reserve a spot in Staci’s Product Shares, please EMAIL ME directly at SRL7698@hotmail.com. For multiple shares -_get a free gift from me! All ribbon shares are wrapped around white chipboard to ensure wrinkle free ribbon. In addition, all shares are protected by cello bag packaging, ensuring safe and dry delivery! and you know I love to package them CUTE!!! This 22 piece share includes three different Brand NEW Embellishments. This share includes (60) 6×6 sheets of Self-Adhesive Die Cuts, Designer Series Paper and Card Stock. You will receive (15) 6×6 pieces from each of the four Brand NEW Simply Scrappin’ Kits. 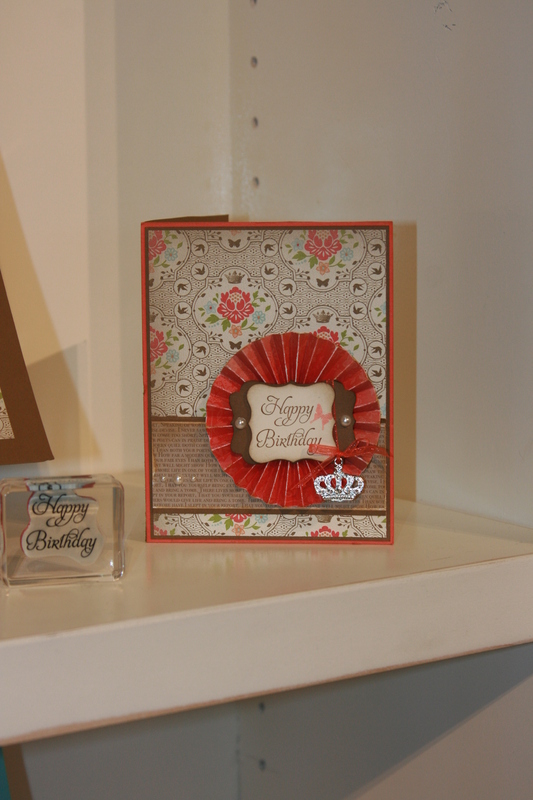 Not only are these kits great for scrapbooking, but they are also perfectly coordinated for cardmaking too. The papers and die cuts are awesome and I know you will love what you receive in this share. It’s super sweet Customers like you, that make doing business a real pleasure. Thank you!!! Come stamp with us for a cause! We will have four fun projects created by different team members. You must RSVP and prepay for this event. We will see you there! Join My Team Today for a GREAT Special! 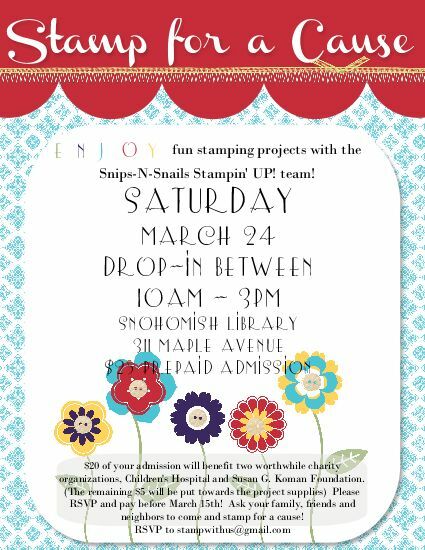 2 DAY Join Stampin’UP! – Join December 13th and 14th for Just $125 and a chance to receive FREE Designer Paper or FREE Digital Downloads each month next year! TODAY AND TOMORROW ONLY (December 13th and 14th) you have the chance to join Stampin’UP! for $125 (regular full kit) and then continue to receive your choice of a pack of DSP or Digital Downloads each month you place an order as a demonstrator in 2012.. WOWOW.. I am able to share this offer because as a Leader I made the choice to attend Leadership. Stampin’ is giving all leaders attending leadership the opportunity to extend this special. And because I am going to Leadership I will have great ideas to share (All those joining my team, attending my January team event or who are one of my directs will receive a CD of over 150 new mini ideas! ), great business tips to share and general whatever else Stampin’ UP! choose to reveal at leadership I will be there to bring back first hand to you. Near or far I know I can help you. This offer is for anyone – never been a demonstrator, just dropped as a demonstrator, was a demonstrator months or years ago. NEED A FEW MORE REASONS TO JOIN TODAY OR TOMORROW? 3. You will have time to be ready for our biggest sales event of the year – Sale-a-bration which begins January 24th. 12. RISING Star – a chance to earn an all expense paid trip to Stampin’ UP!, $1000 cash!!! I could give you even more reasons – tax deductions, on going 20% discount, 15% birthday discount, great rewards, personal growth and development, new friends, some me time, flexibility and so many more. BUT THE TRUTH IS the best way to find out if Stampin’ UP! is right for you is to give it a try – at $125 you get a kit valued at almost $400 with product and materials. There is no obligation, no required starter parties no required anything – just lots and lots of possibilities and opportunities. If you decide “Hey I’ve tried it and it’s not found if you decide not to sell $300 a quarter you are simply left with a great purchase at an incredible price. Hope you consider giving yourself and amazing Christmas Present that could keep on giving! I would be honored to be your upline! Free or Discounted Stampin’ UP! Products! WOW! Stampin’ UP! is offering some great deals and discounts this week and come are today only!! Contact me today to get your Christmas shopping done early or you can order at www.stacilynch.stampinup.netI appreciate your business!! If you have any questions, ask away! 20% Off – November 21 Only! Buy My Digital Studio Express™ and Get a FREE Digital Download Bundle Worth $40! This is the Card box we will be creating for my Holiday Head Start Class on October 14th! 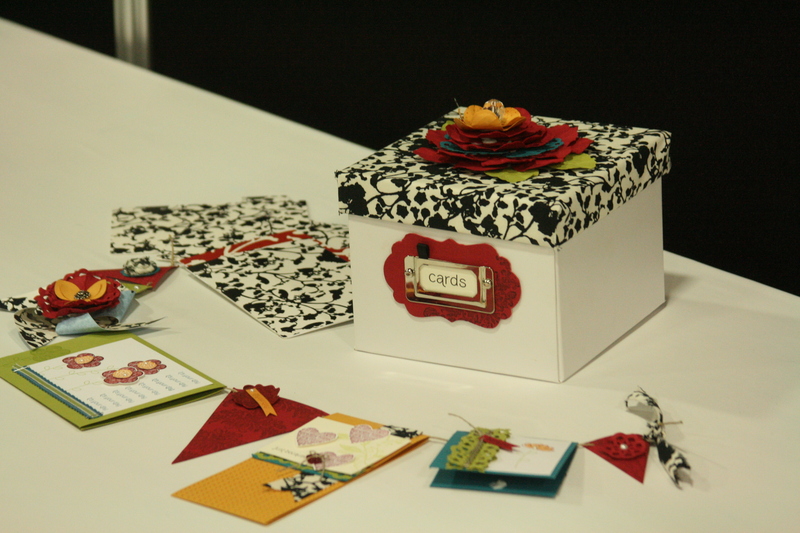 We will also be creating three cards to start you off filling your box! Please RSVP to my by October 4th for this class! If you have any questions you can email me! You can also see more details on my website www.stacilynch.stampinup.net Have a great day! As many of you I wear many hats: Child of God, wife to an amazing man, mother to three wonderful boys, daughter, sister, SU! Demo, friend, the list could go on and on! I first learned of SU! in 2005 and loved it! I became a demo in September of 2006 and don't know what I did without this creative outlet! I now have ventured into the photography world! Thank you for sharing part of your day with me! vicki on All is quiet..
Erica on Do you want FREE Stamps? All content (including text, photographs, and design work) is ©Staci Lynch. Original artwork is shared for personal inspiration only and may not be copied for contest submission or publication. Thanks! !